As shape analysis is intricately related to Lebesgue integration and absolute continuity, it is advantageous to have a good grasp of the two notions. We review basic concepts and results about Lebesgue integration and absolute continuity. Fredholm operators are one of the most important classes of linear operators in mathematics. The aim of these notes is an essentially self-contained introduction to the spectral flow for paths of (generally unbounded) selfadjoint Fredholm operators. An introduction of Hilbert modules over function algebras. The theory of Hilbert modules is presented as combination of commutative algebra, complex geometry and Hilbert spaces and its applications to the theory of n-tuples of commuting operators. A classic of pure mathematics, this advanced text explores the intersection of functional analysis and analytic function theory. Close in spirit to abstract harmonic analysis, it is confined to Banach spaces of analytic functions in the unit disc. This book at the beginning graduate level will help students with primary interests elsewhere to acquire a facility with tools of a functional analytic flavor, say in harmonic analysis, numerical analysis, stochastic processes, or in physics. Contents: Exact Couples and the Connes Exact Couple; Abelianization and Hochschild Homology; Cyclic Homology and the Connes Exact Couple; Cyclic Homology and Lie Algebra Homology; Mixed Complexes, the Connes Operator B; and more. These are notes for a King's College course to fourth year undergraduates and MSc students. They cover the theoretical development of operators on Hilbert space up to the spectral theorem for bounded selfadjoint operators. From the table of contents: Linear operators on a Hilbert space; C*-algebras; Crossed product C*-algebras; Schroedinger operators and essential spectrum; Twisted crossed product C*-algebras; Pseudodifferential calculus; Magnetic systems. These notes are based on lectures given as part of a mathematics MSc program. 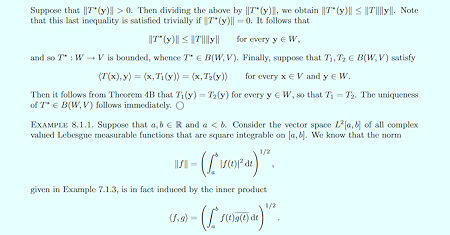 The approach here is to discuss topological vector spaces - with normed spaces considered as special cases. Contents: Topological Spaces; Nets; Product Spaces; etc. These lecture notes are an expanded version of a set written for a course given to final-year undergraduates at the University of Oxford. A thorough understanding of Banach and Hilbert spaces is a prerequisite for this material. This book is the final outgrowth of a sequence of seminars about functors on categories of Banach spaces (held 1971 - 1975) and several doctoral dissertations. It has been written for readers with a general background in functional analysis. The aim of this book is to develop the theory of Banach operator ideals and metric tensor products along categorical lines: these two classes of mathematical objects are endofunctors on the category Ban of all Banach spaces in a natural way. Notes from a course which covered themes in functional analysis and operator theory, with an emphasis on topics of special relevance to such applications as representation theory, harmonic analysis, mathematical physics, and stochastic integration. The book is concerned with the application of a variety of methods to both non-linear (fixed point) problems and linear (eigenvalue) problems in infinite dimensional spaces. Author was interested in the construction of eigenvectors and eigenvalues. From the table of contents: Introduction; The spaces S and S'; The spaces D and D'; The Fourier transform; Convolution; Fourier-Laplace Transform; Structure Theorem for Distributions; Partial Differential Equations; and more. Lecture notes for a 3rd year undergraduate course in functional analysis. By the end of the course, you should have a good understanding of normed vector spaces, Hilbert and Banach spaces, fixed point theorems and examples of function spaces. Contents: Fourier Series; Basics of Linear Spaces; Orthogonality; Fourier Analysis; Duality of Linear Spaces; Operators; Spectral Theory; Compactness; The spectral theorem for compact normal operators; Applications to integral equations; etc. In this book you will learn something about functional analytic framework of topology. And you will get an access to more advanced literature on non-commutative geometry, a quite recent topic in mathematics and mathematical physics. Lecture notes on operator algebras. From the table of contents: Structure Theory I; von Neumann Algebras; States and Representations; Structure Theory II; Matrices; Automorphism Groups; Extensions; K-Theory; Nuclear C* Algebras. A graduate-level introduction to C*-algebras, Hilbert C*-modules, vector bundles, and induced representations of groups and C*-algebras, with applications to quantization theory, phase space localization, and configuration space localization. Examples of Hilbert-Smith operators and other types of integral operators, Hilbert Schmidt norm, Volterra integral operator, Cauchy-Schwarz inequality, Hoelder inequality, iterated kernels, Hermitian kernel, and much more. Spectral Theory - Functional Analysis Examples. Contents: Spectrum and resolvent; The adjoint of a bounded operator; Self adjoint operator; Isometric operators; Unitary and normal operators; Positive operators and projections; Compact operators. Functional analysis examples. From the table of contents: Hilbert spaces; Fourier series; Construction of Hilbert spaces; Orthogonal projections and complements; Weak convergence; Operators on Hilbert spaces, general; Closed operations. From the table of contents: Metric spaces; Topology; Continuous mappings; Sequences; Semi-continuity; Connected sets, differentiation; Normed vector spaces and integral operators; Differentiable mappings; Complete metric spaces; and more. The purpose of these notes is to provide a rapid introduction to von Neumann algebras which gets to the examples and active topics with a minimum of technical baggage. The philosophy is to lavish attention on a few key results and examples. This manuscript provides a brief introduction to nonlinear functional analysis. As an application we consider partial differential equations and prove existence and uniqueness for solutions of the stationary Navier-Stokes equation. This free manuscript provides a brief introduction to Functional Analysis. The text covers basic Hilbert and Banach space theory including Lebesgue spaces and their duals (no knowledge about Lebesgue integration is assumed). This manuscript provides a brief introduction to Real and (linear and nonlinear) Functional Analysis. It covers basic Hilbert and Banach space theory as well as basic measure theory including Lebesgue spaces and the Fourier transform. These two volumes present the theory of operator algebras with applications to quantum statistical mechanics. The authors' approach to the operator theory is to a large extent governed by the dictates of the physical applications. An introduction to the basic ideas in linear functional analysis: metric spaces; connectedness, completeness and compactness; normed vector spaces; inner product spaces; orthogonal expansions; linear functionals; linear transformations; etc. Introduction to Jordan algebras of operators on Hilbert spaces and their abstract counterparts. It develops the theory of Jordan operator algebras to a point from which the theory of C*- and von Neumann algebras can be generalized to Jordan algebras. Written for beginning graduate students of mathematics, engineering, and the physical sciences. It covers elements of Hilbert space, distributions and Sobolev spaces, boundary value problems, first order evolution equations, etc.